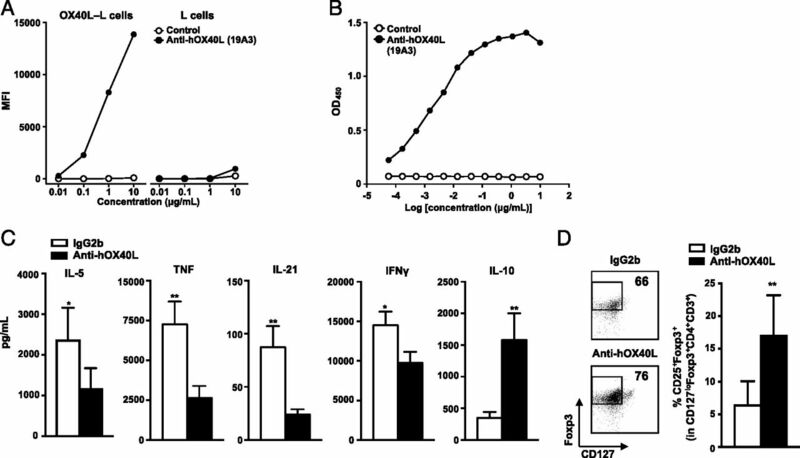 Anti-hOX40L decreases IL-5–, TNF-, IL-21–, and IFN-γ–producing CD4+ T cell responses but increases IL-10–producing regulatory CD4+ T cell responses. (A) Assessment of anti-hOX40L binding to hOX40L-expressing L cells (left) or L cells (right) by flow cytometry. (B) Assessment of anti-hOX40L specificity by ELISA using plates coated with hOX40L protein. Data are representative from three independent experiments. (C) Allogeneic naive CD4+ T cells were cocultured with TSLP-treated mDCs for 7 d in the presence of anti-hOX40L or control Ab. T cells were restimulated overnight with anti-human CD3/28 beads. The amount of cytokines secreted from T cells were measured by a bead-based multiplex assay, (D) Analysis of the frequency of CD4+ Tregs by flow cytometry. All data are representative of at least three independent experiments. Error bars represent mean ± SD of quadruplicate assays. The p values were determined with unpaired Student t test. *p < 0.05, **p < 0.01. 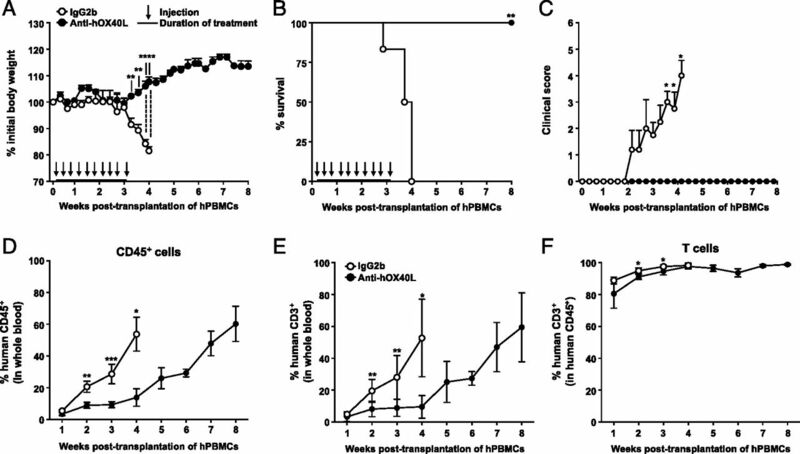 Anti-hOX40L treatment prevents aGVHD development in NOG mice transplanted with human PBMCs. NOG mice received human PBMCs (1 × 107) via tail vein. animals were given anti-hOX40L or IgG2b (10 μg per dose) i.p. three times weekly from day 1 posttransplantation through week 3. (A) Body weight changes, (B) survival rates, (C) GVHD scores, (D) frequency of circulating human CD45+ leukocytes, (E) frequency of CD3+ T cells in whole blood, and (F) frequency of human CD3+ T cells in human CD45+ cells. Error bars represent mean ± SD (n = 5 mice per group). Data are representative of three independent experiments. The p values were determined with unpaired Student t test in (A) and (C)–(F) and Mantel–Cox log-rank test in (B). *p < 0.05, **p < 0.01, ***p < 0.005. Anti-hOX40L treatment decreases the frequency of human T cells in livers, lungs, and spleens of aGVHD mice. 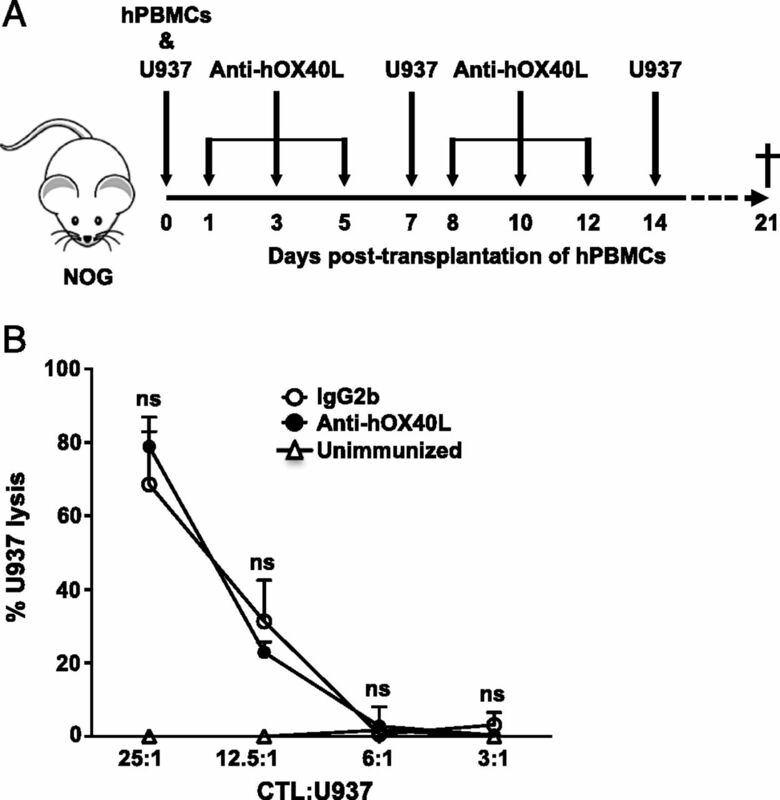 NOG mice received human PBMCs (1 × 107) via tail vein. Mice were given anti-hOX40L or IgG2b (10 μg per dose) i.p. three times weekly from day 1 posttransplantation through week 3. Animals were sacrificed on week 4. (A) Total number of MNCs, (B) percentage of human CD45+ cells in total cells, and (C) percentage of CD4+ and CD8+ T cells in total CD3+CD45+ T cells in liver, lung, and spleen. Error bars represent mean ± SD (n = 5 mice per group). Data are representative of three independent experiments. The p values were determined with unpaired Student t test. *p < 0.05, **p < 0.01, ***p < 0.005. (D) Immunohistochemistry images (original magnification ×10) of human T cell infiltration in mouse liver. Representative data from three independent experiments (n = 5 mice per group) are shown. 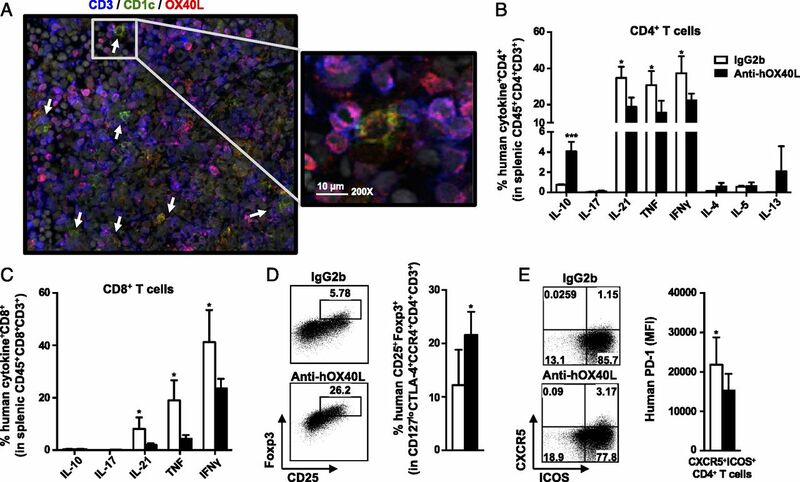 Anti-hOX40L treatment reduces inflammatory T cell responses while promoting Treg responses. (A) Immunofluorescence of spleen. Two weeks after human cell transplantation, spleens of an untreated x-aGVHD mice were collected, and frozen sections were stained for aCD1c (green), aOX40L (red), and aCD3 (blue). The outlined area on the left corresponds to the enlargement on the right. Original magnification ×20 (left) or ×200 (right). Representative data are presented (n = 5 mice per group of three independent experiments). 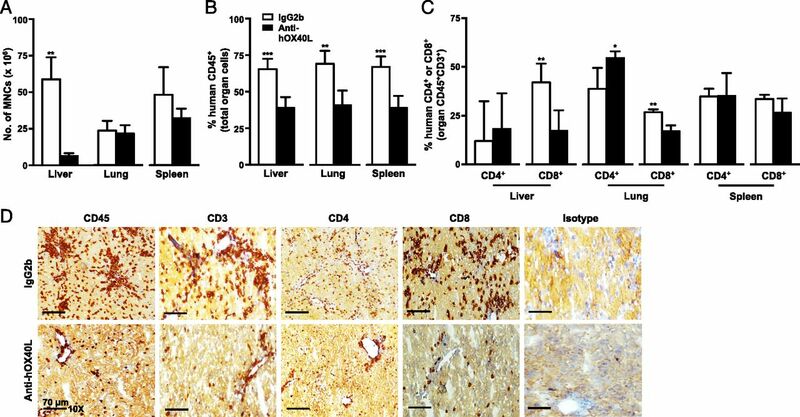 (B–E) Human T cells were isolated from spleens of mice received 10 dose of anti-hOX40L or IgG2b (4 wk posttransplantation). Cells were further stained for cell surface molecules and intracellular cytokines. (B) Intracellular cytokine expression of CD4+ (C) CD8+ T cells after restimulated with phorbol 12-myristate 13-acetate /ionomycin. (D) Frequency of Tregs and (E) Mean fluorescence intensity (MFI) value of PD-1 expression by splenic CXCR5+ICOS+CD4+ T cells. Error bars represent mean ± SD (n = 5 mice per group). Data are representative of three independent experiments. The p values were determined with unpaired Student t test. *p < 0.05, ***p < 0.005. Anti-hOX40L is more effective than combination of etanercept and anti–hIL-21 in preventing aGVHD development. NOG mice received human PBMCs (1 × 107) via tail vein. Mice were given anti-hOX40L (10 μg per dose), combination of anti–hIL-21 (100 μg per dose) and etanercept (100 μg per dose), or isotype (200 μg per dose) i.p. three times weekly from day 1 posttransplantation through week 3. (A) Body weight changes, (B) clinical scores, and (C) survival rates were assessed. Error bars represent mean ± SD (n = 5 mice per group) and data are representative of three independent experiments. Individual p values were determined with Mantel–Cox log-rank test. *p < 0.05, **p < 0.01. Anti-hOX40L treatment does not impair CD8+ T cell functions. (A) Schematic representation of experimental design. (B) Human CD8+ T cells were purified from mouse spleens. Percentage specific lysis was assessed by measuring fluorescence intensity after 4 h incubation of CD8+ T cells and U937 cells labeled with fluorochrome. Error bars represent mean ± SD (n = 5 mice per group) and data are representative of three independent experiments. Statistical significance was determined with Sidak two-way ANOVA test. ns, not significant. Preclinical therapeutic efficacy of anti-hOX40L. NOG mice received human PBMCs (1 × 107) via tail vein. Animals were given anti-hOX40L or IgG2b (10 μg per dose) i.p. three times weekly from day 21 posttransplantation through week 6. (A) Body weight changes, (B) survival rates, and (C) clinical scores were assessed. Error bars represent mean ± SD (n = 10 mice per group). Data are representative of three independent experiments. Individual p values were determined with unpaired Student t test in (A) and (C) and Mantel–Cox log-rank test in (B). *p < 0.05, **p < 0.01.